This was our second stay at Cluj Apartments. 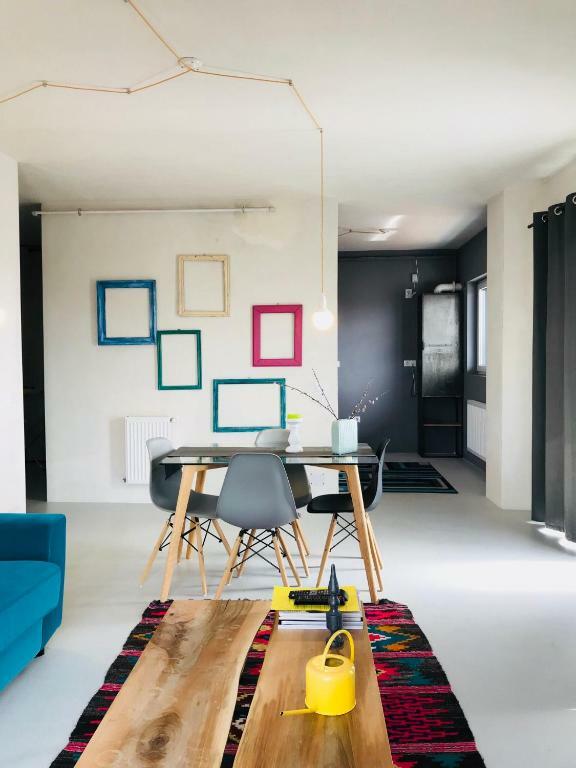 Last summer we stayed with our three children for just one night, but were so impressed by the spacious, super clean, superb location of the apartment that my wife and I impulsively decided to return without the children for a romantic winter holiday. This apartment was even better located—having a direct view of the spectacularly decorated Christmas market—and was decorated in a terrific, retro, art nouveau manner. We couldn’t have been more pleased. Great location and view of main square. Washer was wonderful. Another one by Cluj Apartments! Spotlessly clean, spacious and well lit with an interior design that is jaw dropping and cleverly communicates with the building which was once a factory and currently converted into an apartment building. The urban view from the balcony is fantastic. Dacian we love your touch! Location, location, location!!!! We loved the way the apartment was renovated in great taste! Communication with Dacian was easy. You must read the instructions he sends thoroughly, which I didn't:-) there's an info page on the kitchen table . Very useful. Location was great. Apartment was authentic and very large. The apartment is very tastefully decorated, with high ceilings and big windows, exactly as shown in the pictures. It is located right in the middle of town, within walking distance to very nice cafes and restaurants. It can be tricky to find parking space in front of it, but you can be lucky as we were and find it :). The host was very friendly & helpful. She recommended a great place for dinner and breakfast (cafe Olivio a few hundred meters away on the opposit side of the road serves great coffee and breakfast). The whole apartment was full of character, very spacious and has a nice theme to it. The location is perfect, right in the town center, lots of interesting places near by. Everything you need it is at a maximum of 10 minutes walking. The host was extremely helpful , very understanding and willing to cater to our needs. 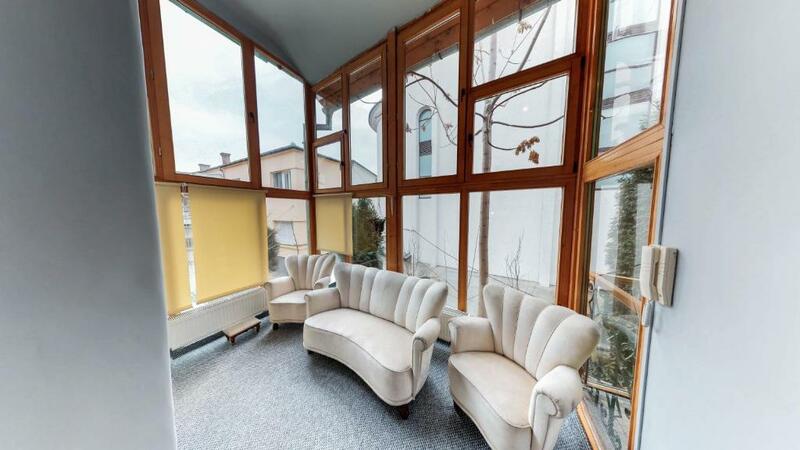 Lock in a great price for Cluj Apartments – rated 9.1 by recent guests! Cluj Apartments This rating is a reflection of how the property compares to the industry standard when it comes to price, facilities and services available. It's based on a self-evaluation by the property. Use this rating to help choose your stay! 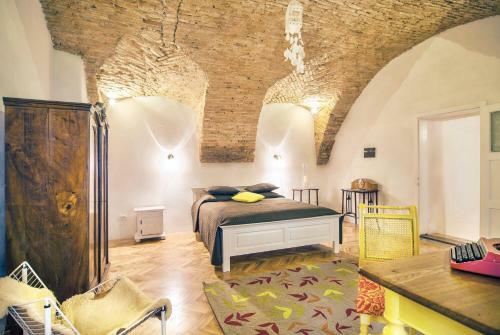 One of our top picks in Cluj-Napoca.Cluj Apartments offers tastefully decorated accommodations in historic buildings on several locations in the center of Cluj-Napoca. Numerous restaurants, bars and shopping opportunities can be found within walking distance and the Piata Unirii Square, St. Michael's Cathedral and the National Art Museum are within 350 feet. Free Wi-Fi is provided. All accommodations units at the Cluj Apartments feature hardwood floors, a kitchen with a dining area, and a living room with a sofa bed. The private bathroom comes with hairdryer and free toiletries. The Botanical Garden is just 0.9 mi away. Main Train Station is approximately 1.6 mi from the apartments, and the Cluj-Napoca International Airport is at a distance of 5 mi. 뀐 Located in the real heart of Cluj-Napoca, this property has an excellent location score of 9.6! When would you like to stay at Cluj Apartments? This retro inspired apartment features hardwood floors, and a seating area consisting of a sofa bed. Offers a view of the St. Michael Cathedral and the main square. Public parking is available at a location nearby (reservation is not needed) and costs RON 2 per hour. Housed in a 19th century building, this spacious and brightly decorated apartment features minimalistic design. The living room offers a seating area with a sofa bed, and the kitchen comes with a dining area. Address: Piata Unirii 14, Cluj-Napoca. Classic design with pieces of antique furniture. Has 2 connecting bedrooms, a living room with a dining area, and a fully equipped kitchen separated from the living area. The apartment also has a balcony and a winter veranda. Address: blvd. Eroilor 28, Cluj-Napoca. The apartment is decorated in the Art Deco style, it has 2 bedrooms, a living room with a sofa bed and a fully equipped kitchen. 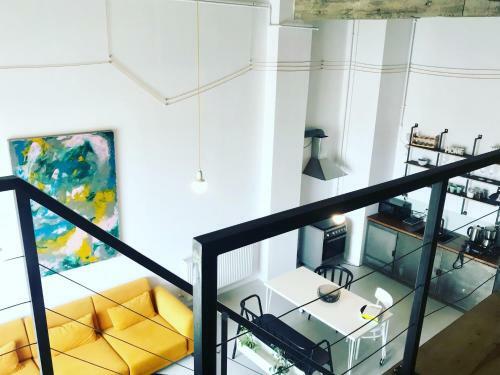 Located in a historical building, right next to "Casa Matei Corvin", this apartment is designed in a modern, colorful style, with accents of post-industrial design, and has 2 bedrooms, a living room with a sofa bed and a fully-equipped kitchen. Private parking is available on site. 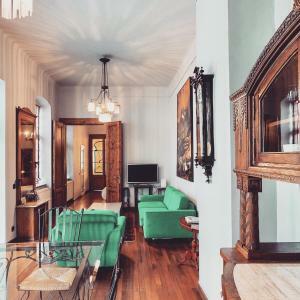 This centrally located apartment is housed in a historic building with high ceilings and hardwood floors. It features a spacious, fully equipped kitchen, a dining area, a bathroom with bath tub and a terrace facing the garden. Free parking is possible in the courtyard. This centrally located studio is housed in a historic building with high ceilings and hardwood floors. It features a kitchenette, a sofa and a terrace facing a green courtyard. Located in the city center, the spacious and bright apartment is housed in a historic building dating back to the 19th century. It features a kitchen, a dining area and a flat-screen TV. This apartment is located in the historical center and features hardwood floors, a dining area and a seating area. Free of charge parking is possible. The apartment is located in the heart of Cluj, in a Bauhaus building, on a quiet paved street, a few yards away from Matei Corvin House and the Museum Square, a popular afternoon meeting point, dotted with cafes and restaurants. Its surface of 35 sqm is divided between the living room with a kitchenette, a separate bedroom and a bathroom. 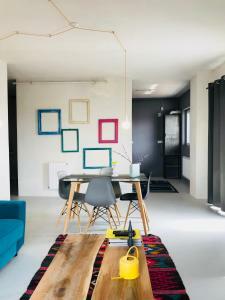 The apartment is decorated in a contemporary style, colorful and with accents of post-industrial design. 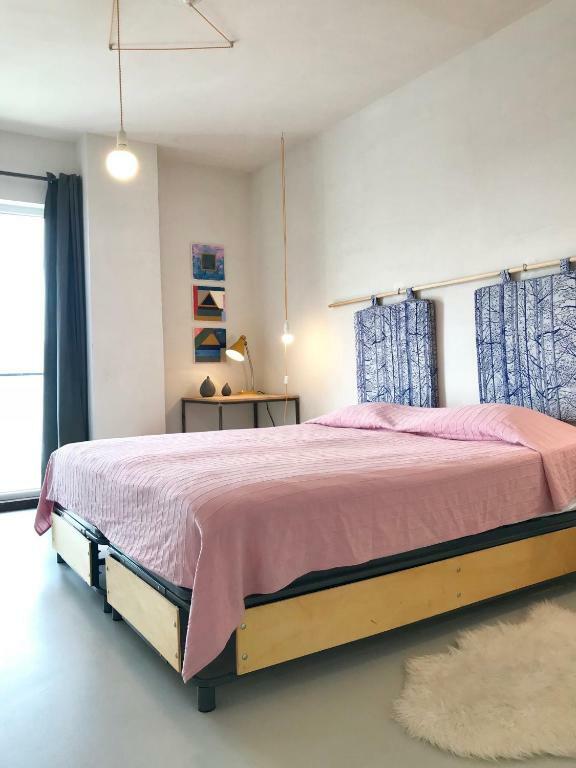 Located in a old ex-factory in the city center that has been recently converted into an apartment building, this loft apartment is very spacious and bright, with panoramic views of the historical center. The design is contemporary, post-industrial, featuring original concrete high ceilings, epoxi floors, custom-made metal furniture and wood. Enjoy the sunset from this top-floor apartment with panoramic views of the historical center and the Citadel hill. Located in a old ex-factory in the city center, that has been recently converted into an apartment building, the apartment is bright and stylish. The design is contemporary, post-industrial, featuring epoxi floors, custom-made metal furniture and wood. Cluj Apartments project is about creating a "home away from home" for travellers. 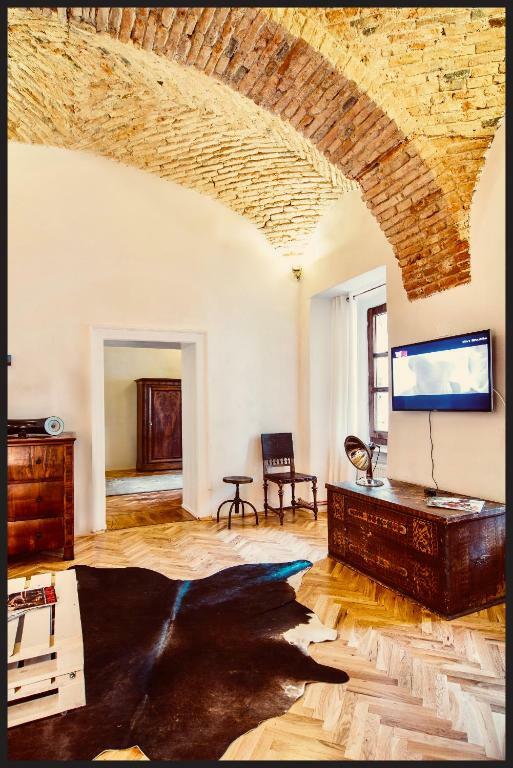 It is about travelling in style, about the comfort and the warm, cosy feeling of a beautifully restored apartment in the heart of the historical center. It is about living like a local, and experiencing the best of what Cluj and Transylvania has to offer. Our serviced apartments are situated right in the center of Cluj, so most of the city attractions are nearby, at walking distance. The best restaurants and cafes, the old city with its narrow, paved streets, most of the tourist attractions, as the Opera House, the Arts Museum, St. Michaels cathedral, are at your door. Welcome to Cluj and enjoy the city! We will be delighted to arrange everything you need during your stay, and give assistance in any way we can. House Rules Cluj Apartments takes special requests – add in the next step! Cluj Apartments accepts these cards and reserves the right to temporarily hold an amount prior to arrival. Please inform Cluj Apartments of your expected arrival time in advance. You can use the Special Requests box when booking, or contact the property directly using the contact details in your confirmation. Lighting in the kitchen not great and he shower water wasn’t very hot. You couldn’t do more than make breakfast in the small kitchen. Loved the location, the kitchen and coffee maker and good wifi. Host was super helpful. Having a washing machine was great. The interior design concept was lovely. Thank you for the towels and the hair dryer! And for coffee! The place didn't have a corkscrew (come on!) or a toaster. The washing machine is going to croak soon unless it gets some TLC. Dear owner, fix this and get 10 points. 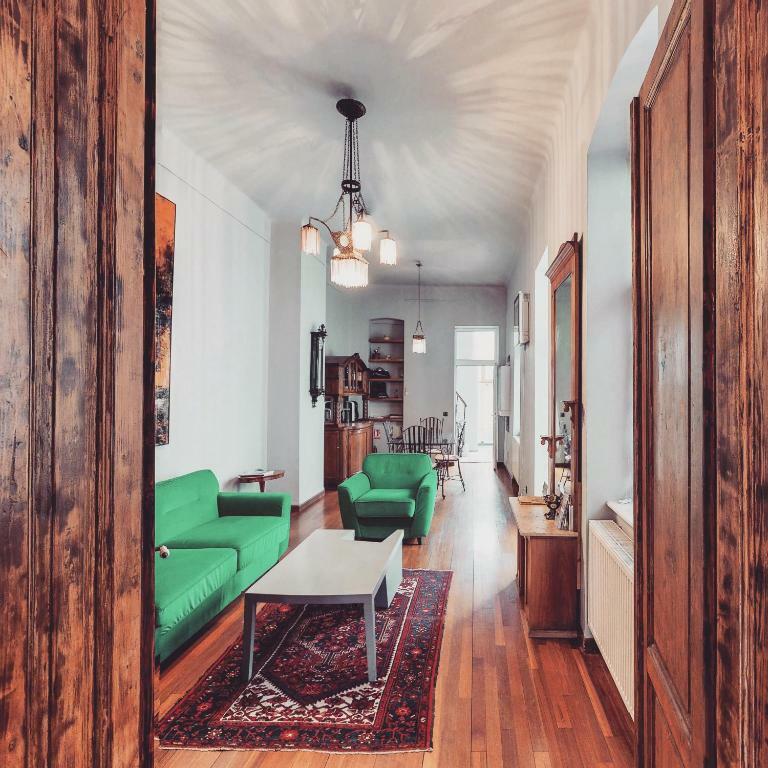 Huge apartment with beautifully restored antique furniture and its own street entrance. Fast WiFi. Excellent bathroom. Superior mattresses. A six-star experience. Try the eclairs in the shop next door. Nice appartment in good location. Easy self check-in. Very clean. Minimalistic decorations, but everything essential is there. Matrasses not very comfortable. One of the bedroom was a bit noisy in the night. Shower was not good. Also getting the key in the dead of the night in darkness from the box that needed precise alignment of the code numbers was not easy at all. A flashlight is absolutely needed. Excellent location. Everything you need, is close-by. Nice host. Clean enough. Shower true retro, could be better. Plenty of space. The stairs in the building are not well lit and the path to the front gate is very dark, almost pitch black with uneven floor. I don't think the apartment owners can do much about that. Slight street noise but overall not a problem. Large property with tall ceilings. Secure and well-heated. Comfortable beds and good water temperature and pressure in the shower. The facilities were very good. Location couldn't be better. They have an excelent access option: you receive entry codes that you can use. Makes it very comfortable to arrive whenever, and leave in the same way. I didn't had to meet someone for the key, and that makes it very comfortable. The water is disgusting, the pipes are leaking metal particles that spread all over the house. Due to the apartment being in the center, parking is a problem. 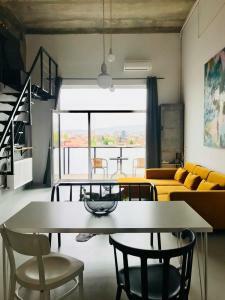 The apartment was perfect and in the center of Cluj. It's very big with all that's needed for self-catering. Communication with the host is great and check-in/-out was very easy. It's great for a traveller who would like to walk everywhere.